Imagine being able to travel back in time for your next family holiday. Dinosaurs instead of Devon? Romans rather than Ramsgate? Camelot, not Corfu? How cool would that be? Alas, whilst I know of no Tardis available for hire, I can at least offer you one way of experiencing a different era: a time when entertainment was analog, not digital; when a sandwich was a sandwich (not a panini or a wrap); and when the very definition of extravagance was a dessert trolley and fanned napkins. 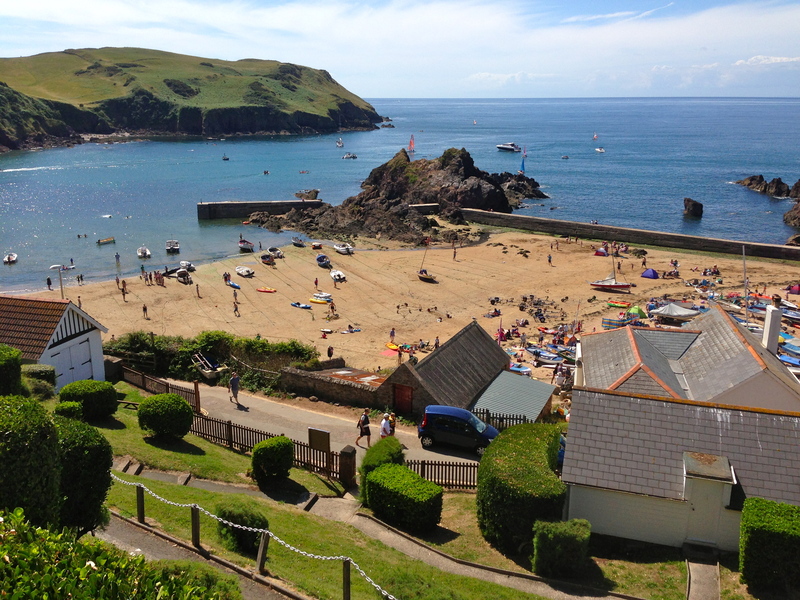 Yes, to experience this, you need simply book yourself a stay at the Cottage Hotel, Hope Cove. My introduction to the Cottage Hotel came courtesy of my parents. Like many devotees, they have been returning to the hotel for years, drawn back by its superlative location on the South West coast path near Salcombe. 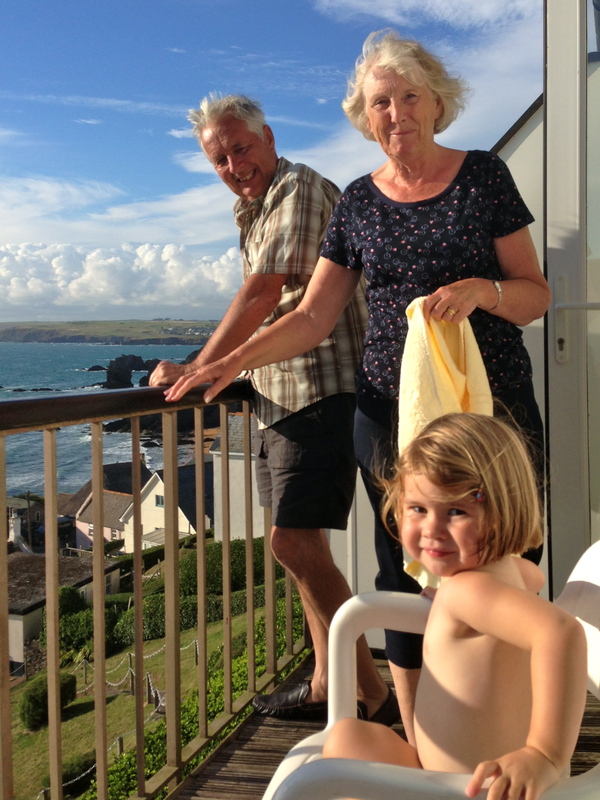 Whilst they enjoy their stays as a couple, they had always imagined how much their five grandchildren (and their mums and dads, of course) would enjoy Hope Cove too. Their 40th wedding anniversary this August was the excuse they needed to assemble us all there. Invitations duly accepted, off we went to Devon. As soon as we parked up in the hotel car park, I could see why my parents love it. The sun was blazing and the sea sparked far below. Beneath us were two sandy beaches, full of happy kids splashing about in the shallows, making sandcastles and eating ice creams. The air was filled with the sound of clinking yacht masts. And, as if by magic, my phone’s 3G connection disappeared. Memories of work and home instantly ebbed. Before I even entered the hotel, I was overcome with nostalgia for holidays past. (The good old British ‘bucket and spade’ – is there anything quite like it?). Entering the Cottage only reinforced this feeling. Everything about the place spoke of a previous era: the carpets, the furniture, the cabinets full of trinkets. It’s about as far from a Design Hotel as you could possibly get. Travelling with children, however, you soon realise how unimportant things like decor are. Leo and Genevieve couldn’t give a damn about the carpets. They were lost in the excitement of rushing between the bedrooms. We stayed in a family room which, whilst dated (the tiles in the bathroom are so old they are *almost* retro), suited us fine; everyone had a bed, for starters (which beats luxury hotels that make the children sleep on the sofa). Best of all, the room was next door to the restaurant, so we were able to put the kids to bed and head to the dining room with a baby monitor to enjoy the five-course dinners (babysitting is offered too should you require it). As if befitting of such an establishment, half-board is standard at the Cottage. However, rather than condemning us to plates of grey, underwhelming food, dinner was the highlight of our stay. My parents had failed to prepare us for how delicious it would be. You could put on pounds here if you’re not careful – the choice is good, the portions are big and then there’s that dessert trolley. The abundant trifles, profiteroles and cheesecakes cannot fail to distract you from your sorbet as they are wheeled around the dining room to other expectant diners (and before you ask, you are allowed more than one choice). For those that want it, kids tea is served early and is cutely laid out for them in the dining room with the necessary seat-covers and clothes to avoid soft-furnishing carnage. All the options were home-made – including pizza and battered fish – with not a turkey twizzler in sight. Leo and Genevieve wolfed it all down and also revelled in the puddings (kids get an early dip at the trolley). Food aside, the joy of a stay at the Cottage is that you don’t actually have to leave, provided the weather is favourable. We parked up on Saturday and didn’t get back into our car until it was time to go. 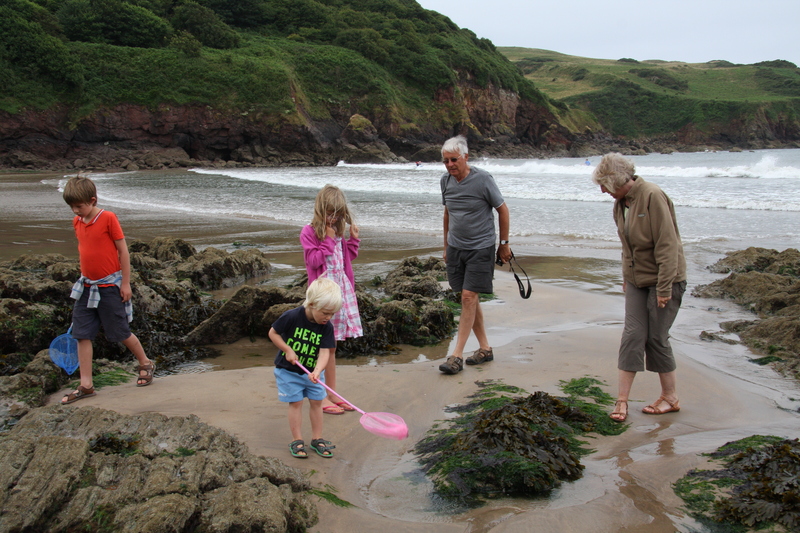 Though diminutive, Hope Cove has a ‘beach for every occasion’. At low-tide, the easterly beach exposes abundant rock pools, which occupied our brood for hours, and large sand flats for playing cricket. When the tide comes in, you can retreat to the westerly beach, where an outlet provides a waterfall and river that can be damned and routed by budding engineers, providing hours of (free!) entertainment. If the weather is bad and the beach becomes intolerable – which was the case for us one afternoon – the hotel does have a games room with coits, a table tennis table and table football. It’s fine for a few hours and we were truly grateful for it. But I could imagine that, if the rain persisted for days rather than hours, you would be forced to leave Hope Cove and seek alternative distractions for energetic children. It is testament to the enduring appeal of the Cottage Hotel that we met several other families there holidaying with the grandparents – some also celebrating wedding anniversaries and birthdays. The place undoubtedly has it’s quirks; we endured a ‘Fawlty Towers’ moment when a light fixture fell from the ceiling as we dined, narrowly avoiding my niece’s shoulder. 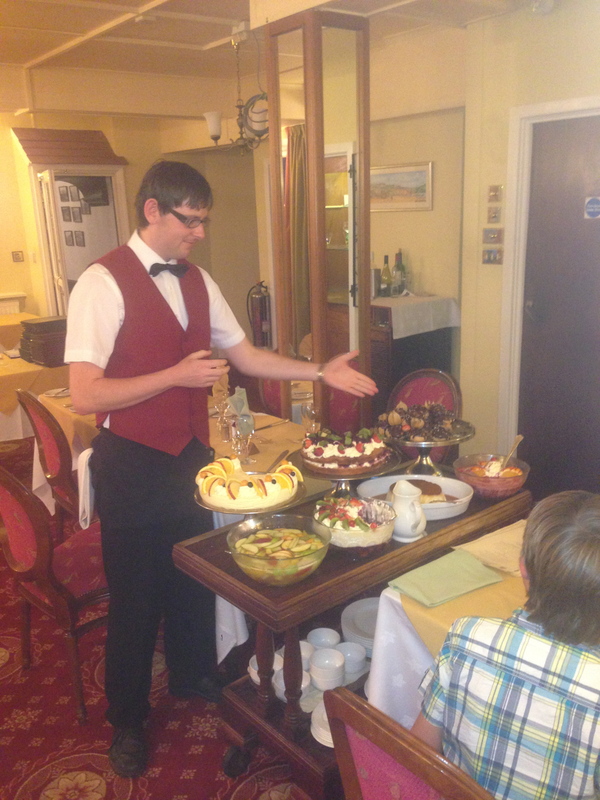 But in a classic ‘Keep calm and carry on’ moment, we continued eating as the front of house team cleaned up around us. Apologetic bottles of prosecco were swiftly delivered to the table. The manager is gradually modernising the place. Some of the seaview rooms (my parents included) have had a much-needed refurb; and he is looking to extend the hotel by creating a new spa. These changes will take the the Cottage a little bit further into the twenty-first century and should create an ever better experience for guests. However, in so doing, I hope the place doesn’t change too much. Having travelled back in time for a few days this summer, I would love to do it all again. 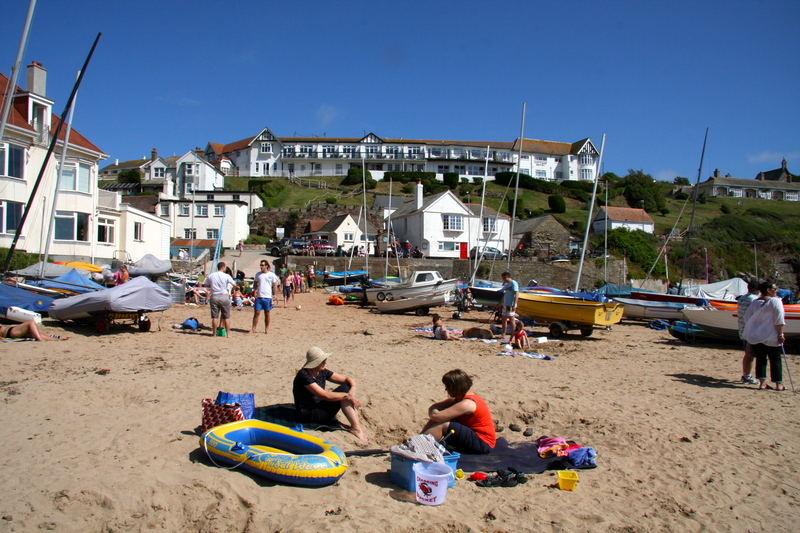 This entry was posted in Accommodation reviews, UK and tagged child-friendly Devon, Cottage Hotel, Devon family holidays, Hope Cove, Salcombe with kids. Bookmark the permalink.